With its very successful 2017-18 season just now completed, Jazz Arts Group (JAG) has recently released details of its exciting 46th Anniversary 2018-2019 season. Byron Stripling and the Columbus Jazz Orchestra’s Swingin’ with the CJO concert series at the Southern Theatre continues with a program tackling a wide variety of styles with assistance from a cavalcade of guest stars: Maurice Hines, Niki Haris, Benny Benack III, Lena Seikaly, Omar Coleman, Joel Frahm, Quan Howell and Shayna Steele. This season’s Jazz Arts Group Presents series concerts will all be held at the Lincoln Theatre as Jazz at the Lincoln and will feature a tribute to Columbus’ legendary saxophonists, a 100th anniversary celebration of the Harlem Renaissance, Jason Marsalis & the 21st Century Trad Band, and the return of the Columbus-founded Huntertones. Other programming includes a collaboration between the CJO and Opera Columbus, the annual One Night Only gala, Columbus Youth Jazz Orchestra Sunday matinees, Offstage at the Academy, and CJO post-show jam sessions after Friday concerts. Keep reading for full details from JAG and get ready for another swingin’ season of great live jazz and more! Columbus, OH — The Jazz Arts Group (JAG) has announced the lineup of concerts, guest artists, and special events on its 2018-2019 season including the Columbus Jazz Orchestra’s (CJO) popular Swingin’ with the CJO concert series at the Southern Theatre and Jazz at The Lincoln, a series of chamber concerts featuring both internationally renowned touring artists and locally-curated events presented in the intimate setting of the historic Lincoln Theatre. JAG’s 46th anniversary season also includes the FREE Off-Stage at the Academy series that brings audiences and artists together for informal conversation and sharing with CJO guest artists, “Opera Swings Jazz,” a collaboration with Opera Columbus, and “One Night Only,” the annual gala fundraising event held this season at the Bluestone. The Jazz Arts Group’s 2018-2019 46th anniversary season sponsors include The Columbus Foundation, the Greater Columbus Arts Council, and the Ohio Arts Council. Additional support comes from Cardinal Health, Bob Evans, Grange Insurance, Ann & Tom Hoaglin, L Brands, Plante-Moran, PNC, State Auto Insurance Companies, Fahn & Denny Tishkoff, The Westin Columbus, and Southwest Airlines – the official airline of the Jazz Academy. Media partners include City Scene Magazine, the Dispatch Media Group, Lamar, Sunny 95, WMNI Radio and WOSU Public Media. Trumpet virtuoso and Columbus Jazz Orchestra Artistic Director, Byron Stripling, leads the high-powered 16-piece CJO in five programs on the Swingin’ with the CJO Concert series at the historic Southern Theatre (21 East Main Street, Columbus) during the 2018-2019 season. Single tickets go on sale Monday, August 13 at the CAPA Ticket Office (39 East State Street), all Ticketmaster Outlets, online at Ticketmaster.com and by phone at (614) 469-0939 or (800) 745-3000. Day-of tickets will be available at the theatre starting two hours before show time. $10-$15 student tickets available at the door with I.D. The Swingin’ with the CJO concert series kicks off with an appearance by Tony Award-nominee Maurice Hines. A star of stage and screen, the singer/tap dancer joins with Byron Stripling and the Columbus Jazz Orchestra in a high energy, tour-de-force evening of hot jazz and dance. Maurice Hines appeared on Broadway and in touring productions of “The Girl in the Pink Tights” with famed French chanteuse and ballerina, Zi Zi Jeanmaire, “Eubie” and “Sophisticated Ladies,” with his tap-dancing brother, Gregory, “Bring Back Birdie!,” with Chita Rivera and Donald O’Connor; and in productions of “Guys & Dolls” and “Jelly’s Last Jam.” Film and television appearances include Francis Ford Coppola’s “Cotton Club” and over 35 appearances on “The Tonight Show.” Mr. Hines has directed and choreographed national tours including “Uptown It’s Hot,” “Satchmo,” “Harlem Suite,” and the Radio City Spectacular, along with music videos for Quincy Jones, and others. The CJO provides the romantic soundtrack to the Valentine’s Day weekend with Unforgettable: Love Songs of Nat King Cole & Others, celebrating the centenary of jazz legend Nat King Cole, and featuring two fresh-faced rising stars on the jazz scene, trumpeter-vocalist Benny Benack III, and vocalist Lena Seikaly, an audience favorite at last summer’s JazZoo performances. Trumpeter/vocalist Benny Benack III is equally at home performing jazz and pop, and equally at home as both singer and trumpet soloist. His singing style has been likened to the great crooners of yesteryear such as Bobby Darin and Mel Tormé, and he has enough dazzling trumpet chops to inspire the great trumpeter Wynton Marsalis to name him among the next generation of jazz greats. Benack is a frequent guest artist at international jazz festivals and has appeared as a soloist with Josh Groban and Ben Folds. His New York club appearances include the famed Birdland Jazz Club, where he recently performed with cabaret icon, Anne Hampton Callaway, and at Bemelman’s Bar in the fashionable Carlyle Hotel where he shares the stage and performances with fashion icon, Isaac Mizrahi. Named “one of Washington’s preeminent jazz singers” and “brightest voices in jazz,” by the Washington Post, Lena Seikaly is making her mark in national and international jazz circles as a revivalist of traditional jazz vocals, as well as an innovator in contemporary vocal jazz styles. She was a semi-finalist at the prestigious 2015 Thelonious Monk Institute International Jazz Vocals Competition and is an alum of the Betty Carter Jazz Ahead program in DC. Audience response to her stunning debut with the Columbus Jazz Orchestra at JazZoo 2017 prompted an immediate invitation from CJO Artistic Director, Byron Stripling, to appear on the CJO’s 2018-2019 season at the Southern Theatre. March madness kicks off with the CJO getting down and dirty in blues country with Nothing But the Blues, featuring Windy City blues vocalist and harmonicist Omar Coleman and saxophonist Joel Frahm. Omar Coleman’s performances are rooted in the blues, spiked with R&B urgency, and resonant with deep-soul passion. He has appeared on jazz and blues festivals internationally and been embraced by such estimable blues legends as Ruth Brown, Sean Carney, Robert Cray, Buddy Guy, Robert Randolph and Koko Taylor. Saxophonist Joel Frahm is a mainstay on New York’s jazz scene with a growing reputation for his big tenor sound, deft assertive playing, and versatility. He moves smoothly from mainstream jazz to down and dirty blues, and has performed with such high profile names as Kenny Barron, Bill Charlap, Kurt Elling, Brad Mehldau, Jane Monheit and Dianne Schuur. During the 2018-2019 season, the Jazz Arts Group will present each of its four Jazz Arts Group Presents series concerts at the historic Lincoln Theatre under the moniker Jazz at the Lincoln. Single tickets go on sale Monday, August 13 at the CAPA Ticket Office (39 East State Street), all Ticketmaster Outlets, online at Ticketmaster.com and by phone at (614) 469-0939 or (800) 745-3000. Day-of tickets will be available at the theatre starting two hours before show time. Celebrating the lives and legacies of legendary tenor saxophonists Rusty Bryant, Rahsaan Roland Kirk, and Gene Walker, the concert will include a world premiere work composed by CJO principal arranger and saxophonist Chad Eby, and feature a roster of notable area saxophonists and instrumentalists. It’s especially fitting that the event takes place at the historic Lincoln Theatre where Rusty Bryant, Rahsaan Roland Kirk and Gene Walker are all inductees in the Lincoln Theatre Walk of Fame. 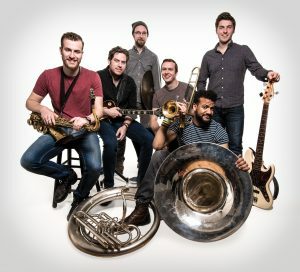 Known for their high energy, horn-driven sound that melds jazz, funk, rock, and soul, Huntertones add depth and contrast to their live sets by shifting from a dynamic six-piece ensemble to a trio featuring saxophone, sousaphone, and beat-boxing, keeping their listeners’ eyes and ears open at every turn. Huntertones formed in Columbus, Ohio at The Ohio State University and hosted their first shows at a house on Hunter Avenue. Their first Midwest tour was sponsored by the Jazz Arts Group. Since relocating to New York City, Huntertones have released two albums, and toured North and South America, Europe and Africa. Individually, members of Huntertones have compiled a diverse resume of collaborations with top artists in pop, jazz, soul, and musical theater. This includes work with Jon Batiste and Stay Human, O.A.R., Snarky Puppy, Stevie Wonder, Andy Grammer, Ed Sheeran, Allen Stone, Gary Clark Jr., Phillip Phillips, We Banjo 3, Umphrey’s McGee, Vulfpeck, and others. They return to where it all started, with an extended residency, arranged by the Jazz Arts Group, in Columbus area schools culminating in a performance at the Lincoln Theatre. On the heels of Opera Columbus Artistic Director, Peggy Kriha Dye’s, debut last season with the Columbus Jazz Orchestra, comes “Opera Swings Jazz,” a lively, fun, and totally non-traditional collaboration that combines the best of opera, jazz, virtuosity and improvisation. “Opera Swings Jazz” will feature the soaring voices of Adelaide Boedecker, Calvin Griffin and DeMeeshia Marshall, along with the high-flying sounds of Byron Stripling and the Columbus Jazz Orchestra. “Opera Swings Jazz” | Friday, April 12, 2019 at 7:30 p.m. | Sunday, April 14, 2018 at 2 p.m. The Jazz Arts Group holds its annual fundraising event, “One Night Only,” Friday, November 2, 2018 at the Bluestone. This year’s theme is “Blues at the Bluestone” and the evening will feature dinner, a silent and “live” auction, and musical performances by Columbus’ own legendary blues guitar hero, Sean Carney, and Windy City blues man, Omar Coleman on vocals and harmonica. Coleman is one of the guest performers featured on the Columbus Jazz Orchestra’s 2018-2019 “Swingin’ with the CJO” series at the Southern Theatre. Joining Carney and Coleman is a rhythm section made up of seasoned area pros, along with several talented youngsters from the Jazz Arts Group’s Youth Jazz programs and Sean Carney’s blues camp project, Camp Blues. “One Night Only” | Friday, November 2, 2018 from 6-10:30 p.m.
Tickets for the event go on sale starting July 1, 2018 at jazzartsgroup.org. The talented youngsters of the Columbus Youth Jazz Orchestra (CYJO) take over the stage of the Southern Theatre Sunday afternoons at 2 p.m. to offer a ½-hour set of classic big band music prior to the start of the Columbus Jazz Orchestra’s performance at 3 p.m. The ½-hour CYJO pre-show concert is FREE with CJO concert admission. The 2018-2019 season will mark the CYJO’s 28th anniversary season. CYJO alumni include jazz pianists Aaron Diehl and Micah Thomas, both of whom are now making names for themselves on the national and international jazz scene. Sunday, February 17, 2019 at 2 p.m.
Sunday, March 17, 2019 at 2 p.m.
Each season the Jazz Arts Group offers a number of free events and the 2018-2019 season is no exception. This series of FREE events offer audiences the chance to engage with guest artists, share their thoughts and ask questions in the relaxed setting of the Jazz Arts Group’s Jazz Academy (769 East Long Street, 4th Floor, Columbus – Above the Lincoln Theatre). Southwest Airlines is the official airline of the Jazz Academy. Saturday, October 20, 2018 at 2 p.m.
Saturday, February 16, 2019 at 2 p.m.
Saturday, March 16, 2019 at 2 p.m. While these events are free and open to the public, capacity is limited and RSVPs through Eventbrite.com are encouraged to guarantee a seat. Following each of the Columbus Jazz Orchestra’s Friday night performances at the Southern Theatre, the audience is invited to the lobby of the adjoining Westin Columbus Hotel for a free jam session featuring members of the CJO and its guest artists. Audience members get to chat with some of their favorite CJO band members, enjoy beverages and listen to an impromptu set of great jazz music. A wonderful musical send-off. Subscriptions for the Columbus Jazz Orchestra’s Swingin’ with the CJO Concert Series at the Southern Theatre are on-sale now. Subscriptions start at just $115 for tickets to all five concerts, and may be purchased at the CAPA Ticket Office, 39 East State Street next to the Ohio Theatre, or by calling the CAPA Ticket Office at (614) 469-0939. The CAPA Ticket Office hours are Monday – Friday, 9 a.m. – 6 p.m., Saturday 9 a.m. – 2 p.m. Single tickets for Jazz Arts Group events, including the CJO’s Swingin’ with the CJO concert series, the Jazz Arts Group Presents Jazz at the Lincoln concert series go on-sale Monday, August 13, 2018 at 10 a.m. at the CAPA Ticket Office (39 East State Street), by phone at (614) 469-0939 or online at www.ticketmaster.com. Single tickets range in price from $15 – $68 (plus a $3 per ticket CAPA facility fee). $10 and $15 student tickets will be available throughout the season two hours in advance of show time at the door with I.D. (CAPA facility fee applies).